Today, I finally saw Les Misérables. Being a fan of plays and musicals, I wanted to see this film for quite some time. While I was aware of the general premise behind the film, I never read the novel or saw the musical. I’m glad to say that it was a terrific film, filled with glorious music and a stellar cast. To me, what was most interesting about the movie was that Colm Wilkinson, the original Jean Valjean, passed the torch to Hugh Jackman. 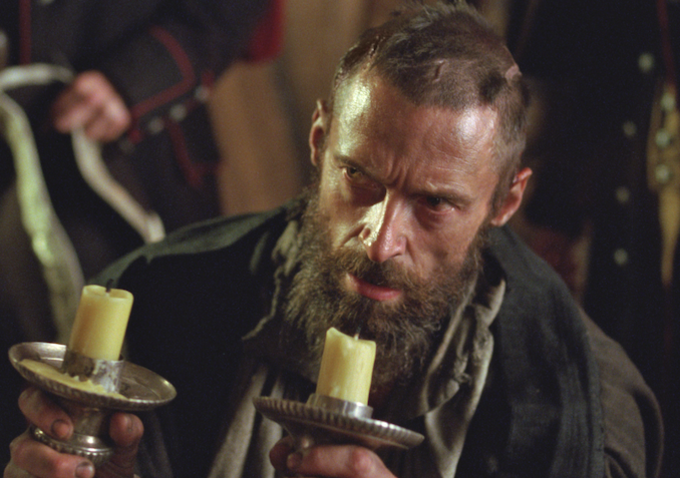 Wilkinson’s presence in the film was a smart way to pay homage to the original musical, and the message behind the scene where he handed candlesticks to Hugh Jackman’s character was clear: The torch has been passed. Wilkinson, a fixture of Broadway, lent his voice to an extensive list of musicals, including: Les Misérables, The Phantom of the Opera, Man of La Mancha, and Jekyll & Hyde, just to name a few. Now it’s Hugh Jackman’s turn. As you’ll see from the video below, this symbolic passing also took place off the screen. For those yearning for Colm Wilkinson’s Jean Valjean, below is a video of him performing “Bring Him Home” at the Les Misérables 10th Anniversary Concert.